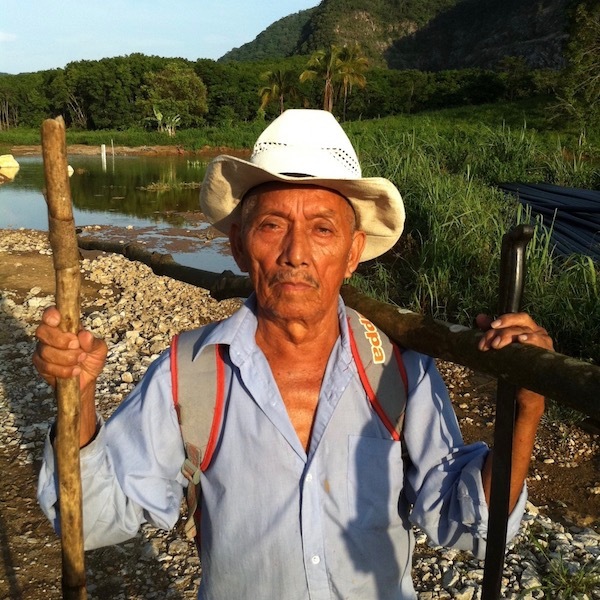 Accountability Counsel supported three Indigenous communities in Oaxaca, Mexico to successfully negotiate an end to the Cerro de Oro Hydroelectric Project, which threatened physical safety and health and would have destroyed the Arroyo Sal, a freshwater spring used for fishing, drinking water, and cultural resources. This case is a model of the use of dispute resolution to ensure free, prior, and informed consent to defend and protect the environmental and human rights of local communities. In 2009, Accountability Counsel began support for the communities of Paso Canoa, Santa Ursula, and Cerro de Oro as they worked to have their concerns heard by the investors and operators of a project to create a hydroelectric facility adjacent to the Cerro de Oro Dam. The project, financed by the U.S. agency Overseas Private Investment Corporation (OPIC), would have produced electricity for private companies in a neighboring state. Our deep accompaniment of these communities included trainings about use of the OPIC Office of Accountability (OA) and support in the drafting of complaints to the OA on behalf of the villages of Paso Canoa, Santa Ursula, and Cerro de Oro. We then accompanied the communities through every step of the accountability office process. With our assistance, the communities participated in a successful dialogue process through OPIC’s OA. The professionally-mediated process included participation from the communities, the Mexican operating company, the New York based investment firm, and the OA. Federal, state, and local representatives of the Mexican government also officially witnessed each meeting of the dialogue table. The parties reached an agreement through this process in March 2011, which halted project construction. Shortly thereafter, through further agreements, the parties hired a series of experts to study safety of the existing dam and hydrogeology of the project site. In November 2011, the communities and the company agreed to stop the project. It remains stopped today and the Arroyo Sal is again a thriving ecosystem. Accountability Counsel filed complaints on 30 November 2010, on behalf of the villages of Paso Canoa and Santa Ursula, and on 17 January 2011, on behalf of the neighboring community of Cerro de Oro. The complaints detail harm caused by the Overseas Private Investment Corporation-supported Cerro de Oro Hydroelectric Project. The complaints also detail risk of future harm to the environment, public health, and safety of the region due to the risk the project posed to the curtain of the Cerro de Oro Dam. The complaints were filed with OPIC’s Office of Accountability (OA), which convened a dialogue table between the communities, the company, and the investors as part of its dispute resolution function. The Cerro de Oro Hydroelectric Project entailed converting the existing Cerro de Oro Dam and reservoir into a hydropower project through the construction of a water intake and conduction tunnel, powerhouse, voltage elevation substation, tailrace channel, and transmission lines. The project was funded in part through a $60 million investment by OPIC, a U.S. agency, in U.S.-based Conduit Capital Partners, LLC. The Cerro de Oro Project was one of Conduit’s investments through its Latin Power III fund. The project operators were Electricidad del Oriente and Corporación Mexicana de Hidroelectricidad (COMEXHIDRO). All of the energy generated by the project would have been sold to private companies. The complainants are predominantly Chinanteco Indigenous People. They live in the area directly affected by the project in the State of Oaxaca, one of Mexico’s poorest and most vulnerable regions. They are mostly farmers and laborers who harvest fruits, rubber, sugarcane, and other natural products from the land and use fishing to supplement their incomes and diets. The story of the Cerro de Oro case began in the 1980s, when approximately 26,000 Chinanteco people were forcibly displaced to make way for the Cerro de Oro Dam. The recent Cerro de Oro Hydroelectric Project built on that legacy of harm. The people who remained in or returned to the area despite the disastrous impacts of the original dam’s construction faced devastation for the second time. At the time Accountability Counsel became involved, project activities had already begun to cause harmful impacts. Cement had leaked into drinking water, blasts from explosives had damaged homes, and land acquisition practices had disrupted local culture. Community members had not received full information about the project and had not been consulted about the project’s health, safety, and environmental impacts or any planned mitigation measures. While a “Third Party Environmental Compliance Review” was conducted, major environmental impacts were not addressed, and mitigation measures for those impacts were therefore not proposed or adopted. We confirmed that those who drafted the Review had never visited the project site. Prior to Accountability Counsel’s involvement in the case, community groups and Oaxacan civil society groups had voiced concern and petitioned the government about the new project’s potential impact on the environment and the wellbeing of nearby residents, but had not had any success in halting or altering the project. At the request of community leaders, Accountability Counsel made an initial trip to visit the affected communities in October 2010 to gather information about the project and its impacts, as well as to meet with impacted communities about the possibility of filing a complaint with OPIC’s Office of Accountability. Community members in Paso Canoa and Santa Ursula voiced significant concerns about and opposition to the project and decided to file a complaint with the OA. The community of Cerro de Oro later decided to join the complaint. Members of the community closest to the project, the village of Los Reyes, had been intimidated into signing agreements with the Company stating that they would not talk about the project with outside organizations and did not attend meetings during our initial visit. Given the potentially serious impacts on Los Reyes, as well as the illegal silencing of community members, Accountability Counsel sought the president of OPIC’s assistance in initiating a compliance review, arguing that OPIC’s policy of allowing the president to initiate a compliance review is meant for situations precisely like this one, where a complaint cannot emanate from a community for fear of retribution or retaliation. The president did not respond. Ultimately, all four villages participated in the historic dialogue process, professionally mediated by the OA’s consultant, Juan Dumas. The dialogue process included participation by the company, the investors, the OA’s Director, and was witnessed by the Mexican government. The process led to engagement of a series of a experts and produced agreements that resulted in a decision to cease the project. As a result of our work, the communities protected the Arroyo Sal freshwater creek and the project remains stopped. It is the first example we know of where Indigenous communities used a dispute resolution process to make their right to demand free, prior, and informed consent (FPIC) meaningful. Learn more about the OPIC Office of Accountability process in this case and our impact. Fundar, Centro de Análisis e Investigación A.C. is dedicated to advocacy and monitoring of public policies and institutions through applied research, critical reflection, experimentation and linkage with civil, social and governance. We have worked with Fundar’s program on Transparency and Accountability in International Financial Institutions. Servicios para una Educación Alternativa A.C. promotes justice, equity, and social participation to achieve improvement in the quality of life for marginalized sectors of the population of Oaxaca. Habitat International Coalition América Latina is an international network dedicated to acting for the recognition, protection and full realization of the right of every human being to a safe place in which to live in peace and dignity in all countries. HIC-AL is the regional coordination office for Latin America and brings together over one hundred organizations from 19 countries: Argentina, Bolivia, Brazil, Colombia, Costa Rica, Cuba, Chile, Ecuador, El Salvador, Guatemala, Honduras, Mexico, Nicaragua, Panama, Paraguay, Peru, Dominican Republic, Uruguay and Venezuela. Berkeley’s International Human Rights Law Clinic designs and implements innovative human rights projects to advance the struggle for justice on behalf of individuals and marginalized communities through advocacy, research, and policy development. Environmental Defender Law Center works to protect the human rights of individuals and communities in developing countries who are fighting against harm to their environment. Accountability Counsel submitted a document on the OPIC OA Draft Operating Guidelines based on the Cerro de Oro case. Read more about Accountability Counsel’s advocacy related to the OPIC policy review process here. OPIC management responded to the OA’s Compliance Appraisal Report in October 2012. The response demonstrates that the case has had a concrete impact on OPIC’s attention to social and environmental risks associated with their investments and the need to ensure that project-level grievance mechanisms function properly. The OA determined in its Compliance Appraisal Report that a full compliance review to determine OPIC’s compliance with its own policies in funding the Cerro de Oro Hydroelectric Project was not necessary in this case, concluding its involvement in the case. The report is also available in Spanish. While the appraisal report did not include formal compliance findings, it did generate several important recommendations for OPIC aimed at avoiding problems that arose in this case. Although the recommendations, if implemented by OPIC, will benefit future communities impacted by OPIC projects, the overall tone of the OA’s report demonstrated the OA’s continued bias towards the communities and its misunderstanding of the compliance violations raised in the complaint. The OA’s Compliance Appraisal Report concludes its involvement in this case. The OA issued a final problem-solving report summarizing its perspective on the problem-solving process. Accountability Counsel had submitted a letter to the Office of Accountability highlighting problems in an earlier draft of the report, including mischaracterizations and bias on the part of the Office of Accountability. These problems are unfortunately still present in the final version of the report. The report is also available in Spanish. This cost-benefit approach, which gives the Director of the OA complete discretion to weigh costs and benefits, is not part of the congressional language mandating the OA, the Board resolution establishing the OA, nor is it described on the OA website or in printed materials. Read more about our policy work aimed at addressing this problem here. At the final meeting of the OA’s dialogue table, representatives of the communities of Paso Canoa, Santa Ursula, and Cerro de Oro delivered a joint decision rejecting the alternative and original projects. Remaining dam safety concerns are one of the communities’ primary reasons for rejecting any further project construction. Authorities of the community of Los Reyes, however, stated that they wanted the project to continue, reasoning that they needed the work. Representatives of the communities of Paso Canoa, Santa Ursula and Cerro de Oro delivered a letter to the OA reiterating their request for a compliance audit to evaluate OPIC’s alleged non-compliance with OPIC policy in the support for the Cerro de Oro Project. Despite multiple requests since filing their complaints, the communities had not received any information regarding how or when the OA would conduct an audit. The director of the OA announced that he was formally ending the participation of the OA in the dialogue process, but suggested that dialogue could continue with the Oaxacan state government. Throughout the meeting, he abandoned his neutral role by lecturing the communities about it being irrational to have not agreed to the project. Oaxacan Sub-Secretary Oscar Cruz indicated that the Oaxacan government was interested in continued dialogue with the communities. 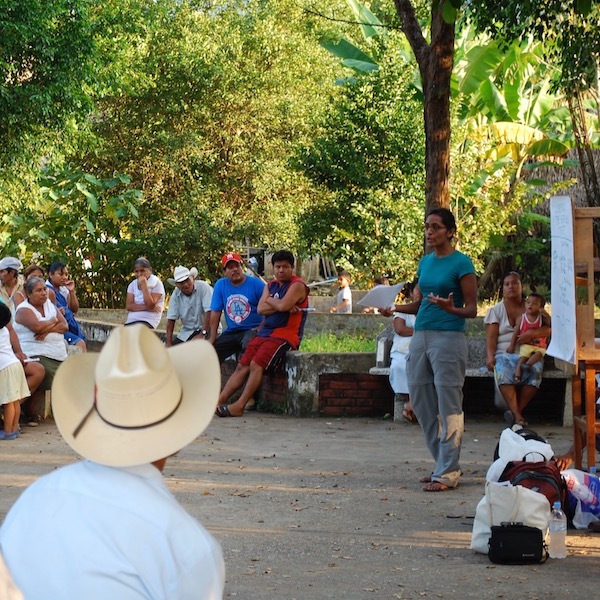 Flores Berrones and CONAGUA presented their final dam safety studies to all four communities. Neither study addressed the communities’ concerns regarding the continued presence of risk factors at the dam and reservoir. The company then presented the alternative project, which involved building the machine house further away from the Arroyo Sal and constructing a large discharge canal as close to the dam curtain as possible (essentially through Los Reyes). After the presentation, the communities again expressed their opinion that the dam safety study presented by Flores Berrones did not fulfill the requirements of the March 2011 agreement, given that Flores Berrones had not relied on any instruments in assessing dam safety. Due to remaining uncertainty regarding dam safety, the community representatives viewed the study as incomplete and refused to allow the Company to present the alternative project to the communities, as originally planned. Oaxacan Governor’s Sub-Secretary, Oscar Cruz, attended each of the presentations and urged the communities to be open to the alternative project. The Director of the OA sent a letter to the Governor of Oaxaca, Gabino Cué Monteagudo, explaining the process to date and expressing his opinion that there was not enough trust between parties for the OA problem-solving process to continue to function. The Director asked for a meeting with the Governor and suggested that the Governor’s office may be better suited to help move the process forward than the OA. The Director of the OA did not ask the communities whether they wanted the Governor to continue the dialogue process and were not consulted regarding the transfer of their complaint to a new entity. The expert Raul Flores Berrones circulated his Final Dam Safety Study (only available in Spanish). Representatives of the four communities sent a letter to the Company and the OA (only available in Spanish) informing them that each community had decided in their community assemblies that they could not make any decisions with respect to the whether the was a basis for continuing dialogue until after the final dam safety studies and the study regarding the Arroyo Sal had been completed and presented to the communities. The expert Flores Berrones presented his Final Study on Impacts to the Arroyo Sal (only available in Spanish). The communities and the Company also reached a third agreement (only available in Spanish), under which the communities agreed to inform the Company by August 1, 2011, whether the alternative project presented was a basis for continued dialogue. They also agreed to have CONAGUA, the Mexican agency in charge of monitoring dam safety, write a report regarding the safety of the Cerro de Oro dam, and that only after CONAGUA issued the report would the company be allowed to present the alternative project to the communities. Accountability Counsel and community representatives accompanied Flores Berrones on a boat ride in the reservoir so that he could observe the other side of the dam curtain and the area of the dam reservoir to the north (something he had not done in reaching his initial conclusions). Among other risk factors, the group observed large trees growing on the dam curtain and sediment so high on one side of the reservoir that people were planting corn in land where water was once 18 meters deep. Flores Berrones presented his methodology report to each of the four communities. In each of the presentations, Flores Berrones explained the construction and make-up of the dam curtain and the most common failures for dams built in this manner. He noted that the most common failures for a dam of this nature are: (1) water coming over the top of the dam curtain; (2) instability of the walls of the dam, which would cause cracks along the top of the dam curtain; (3) instability of the cementation below the dam, which would also cause cracks along the top of the dam curtain; and (4) tubification of the dam curtain. According to Berrones, tubification is common and can be caused by earthquakes, explosions, or holes caused by roots or animals. Flores Berrones largely failed to address concerns raised by community members that features of the dam curtain and reservoir, such as the trees growing out of the dam curtain and the high levels of sedimentation in the reservoir, seemed to put the dam at risk of failure. Based on his review of available documents and a visual inspection, Flores Berrones concluded that the Cerro de Oro dam was well designed and built, was behaving according to its design, and that the use of explosives to construct the Project would not cause damage as long as the company’s use of explosives conformed to international standards. Nonetheless, Flores Berrones recommended the installation of modern instruments and emphasized that the dam needed active monitoring both by the communities and CONAGUA, the federal agency responsible for dam safety. The expert Flores Berrones circulated a methodology report and initial assessment of the safety of the Cerro de Oro dam (only available in Spanish). According to the report, frequent visual inspection is the most important way to monitor dam safety, although one can also use various instruments. At the Cerro de Oro dam, however, many of these instruments were no longer functional and could not be used by Flores Berrones to assess the safety of the dam. Among other things, Flores Berrones recommended that all of the instruments be reactivated so that dam safety could be better monitored in the future. There were no recommendations regarding who should reinstall the instruments or cover costs of reinstallation, and with what timeline. he expert Flores Berrones and his hydrogeologist, Luis Valasquez, went to the area to do an initial study of dam safety and take samples of the water in the Arroyo Sal. There was a great deal of controversy surrounding this visit. Flores Berrones arrived without instruments and, after nothing more than a visual survey of the dam curtain, declared that the dam was safe. The hydrogeologist took initial samples of salinity from the water in the Arroyo Sal and declared that the Arroyo Sal is not a natural spring, or manantial, but rather filtered water from the dam. These declarations caused the communities to loose faith in the expert and hydrogeologist because they expected the expert to do a technical study of the dam’s safety, using appropriate instruments, and because their historical knowledge of the area tells them that the Arroyo Sal is a spring, not a filtration from the dam, since the spring pre-existed the dam. The four communities and the Company reached a second agreement (only available in Spanish), in which they selected Raul Flores Berrones as the expert for the dam safety study. Representatives from the communities, the company, and the OA reached an historic agreement at the dialogue table. The agreement formalized the suspension of the project and placed the future of an alternate design for the project into the hands of the communities. Read the original Spanish version. Specifically, the agreement called on the company to prepare an alternative project that would avoid use of the Arroyo Sal, the spring-fed creek relied on by the communities that the original Project would have destroyed, after which the communities would decide whether they wanted the original project, the alternative project, or no project. The company agreed to accept the decision of the communities and to suspend all work until a decision had been made. The communities and the company also agreed to commission an expert study regarding the risks posed by the project to the safety of the dam curtain. The OA contacted representatives from Los Reyes and determined that the community wanted to join the dialogue process. The communities of Los Reyes, Santa Ursula, Paso Canoa and Cerro de Oro and the Company entered into a dialogue process mediated by professional mediator Juan Dumas. Local, state and federal representatives of the Government of Mexico witnessed the meetings of the dialogue table. The company agreed to suspend the project as a result of the February 17 meeting. At that point, the suspension was a voluntary act taken outside the context of the OA process. At the urging of the communities and under the leadership of local Tuxtepec representative to the Oaxacan Congress, Angela Hernandez Solis, the members of the Oaxacan Congress used the information in the communities’ complaint to launch their own investigation into the Project. The Congress unanimously voted to form an 11-person Commission to tour the area, and on February 17, 2011, the Commission convened a meeting in Oaxaca City to discuss the results of their tour with the Company and public. At the meeting, attended by community representatives, the Company, local officials, academic institutions and the press, the community representatives demanded suspension of the Project. The OA’s mediator, Juan Dumas, returned to the communities without notifying Accountability Counsel as the communities had requested be done for all communications. The trip was problematic because a number of the community members expressed concern and confusion about why the OA was sending their representative without notifying Accountability Counsel. 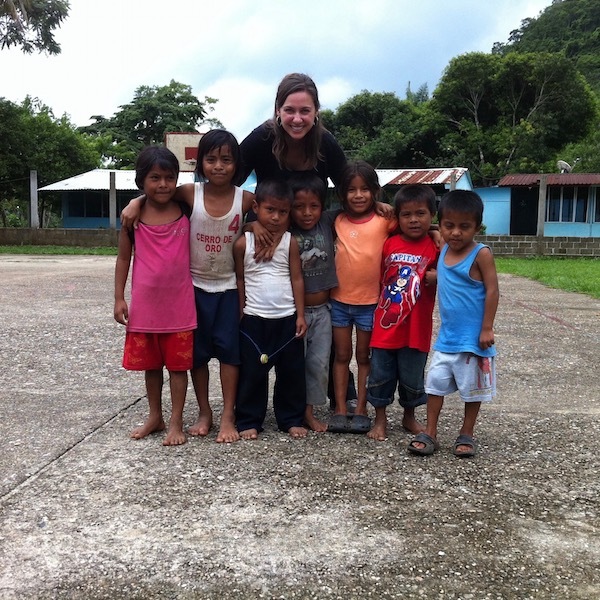 Accountability Counsel assisted the community of Cerro de Oro in filing an addendum to the original complaint. The OA made two site visits to appraise the potential for convening a problem solving dialogue. The OA visited the project site and spoke with The Company, municipal authorities, and community members from Paso Canoa, Santa Ursula and Cerro de Oro before determining that there was a problem solving dialogue could potentially help resolve key issues raised in the complaints. Accountability Counsel accompanied the communities during this initial site visit. The OA delegation included the outgoing director of the Office of Accountability, Dr. Jean Aden, the incoming director, Dr. Keith Kozloff, an OA-hired mediator, Juan Dumas, and a translator. The OPIC OA registered the complaint from Paso Canoa and Santa Ursula. Accountability Counsel assisted the communities of Paso Canoa and Santa Ursula in filing a complaint with the OPIC OA. The complaint is also available in Spanish. Negotiated agreements between the project sponsor and complainants address all remaining issues, including those regarding land use, health, and the environmental and social impacts of the project. Accountability Counsel sent a letter to the president and CEO of OPIC, asking her to join the community of Los Reyes to the request for compliance review and explaining that Accountability Counsel had reason to believe that community members in Los Reyes were being intimidated and had therefore not joined the complaint. We described the company’s demand that Los Reyes agree not seek support from outside “organizations,” despite the potentially significant impacts that the project would have on the community. OPIC signed a contract (see part 1, part 2, part 3, and part 4) with Conduit Capital Partners, LLC agreeing to invest $60 million in The Cerro de Oro Hydroelectric Project. Accountability Counsel’s work with the Cerro de Oro communities produced an example of Indigenous Chinanteco people successfully using free, prior and informed consent (FPIC) as the basis to withhold their consent through a dialogue process to defend their rights and protect their environment. We conducted multiple, extensive trainings in each community to assist the communities in their evaluation of whether to use the OPIC Office of Accountability, we assisted the communities with the research and drafting of their complaints, and we prepared them for each meeting of the dialogue table. We also assisted them in every step of the dispute resolution process and in working to ensure that the compliance review process was independent, fair, transparent, and effective. As a result of our work, the communities successfully used the OPIC Office of Accountability process to negotiate a cessation of the project. Our work stopped harm that was already occurring and prevented devastating impacts, including: loss of a critical freshwater source used for fishing, drinking, and as a cultural resource; risk to the safety of the unmonitored dam curtain due to blasting activity that was already cracking local homes; threats to the ecology of the region; and livelihood impacts for the surrounding Chinanteco Indigenous communities. Our advocacy related to OPIC ensured that all levels of the U.S. agency were aware of the due diligence failures this project involved. Our work on this case and one in Liberia later led to formal changes to improve OPIC’s social and environmental policies. 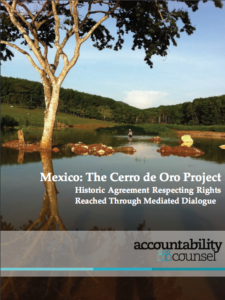 Learn more about Accountability Counsel’s historic win in this report on the Cerro de Oro case.